I've not found a description of this canyon, so I'm posting one. I don't know if it has a name, either, which ... erm, may be why I couldn't find a description! Or it could be that this minor canyon has not been deemed worthy of notice? At any rate, here's some info on this spot. Route description, second canyon north of Grapevine Springs. Overview: This is an easy canyon for hiking. It’s neither as awe-inspiring as Fall or Mosaic Canyons, nor as mysterious and shadowy as the slot canyons, but it has its own interest and charm. And it appears to be seldom visited, making wildlife sightings perhaps more likely. 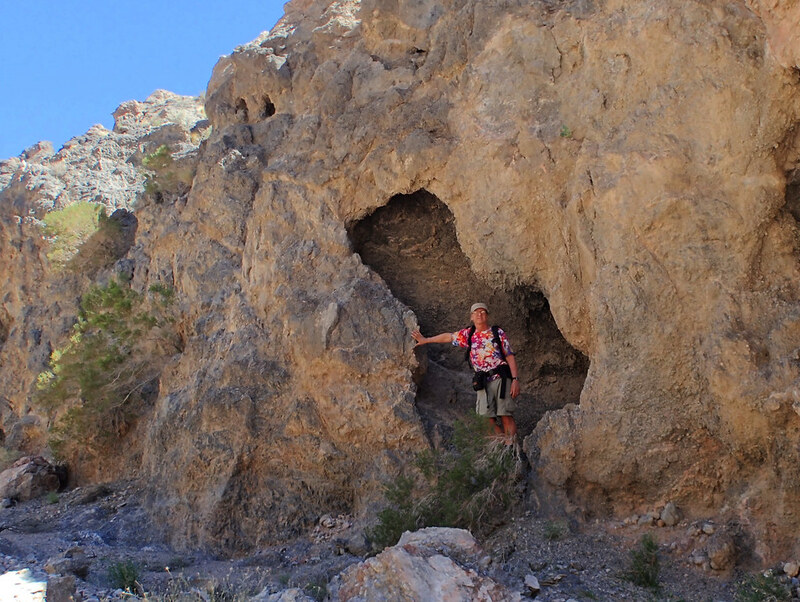 Access: From Furnace Creek, drive north on Highway 190 to the turnoff to Scotty’s Castle road; then continue north and take the Ubehebe Crater road. Turn from the paved Ubehebe road onto the graveled Big Pine road. 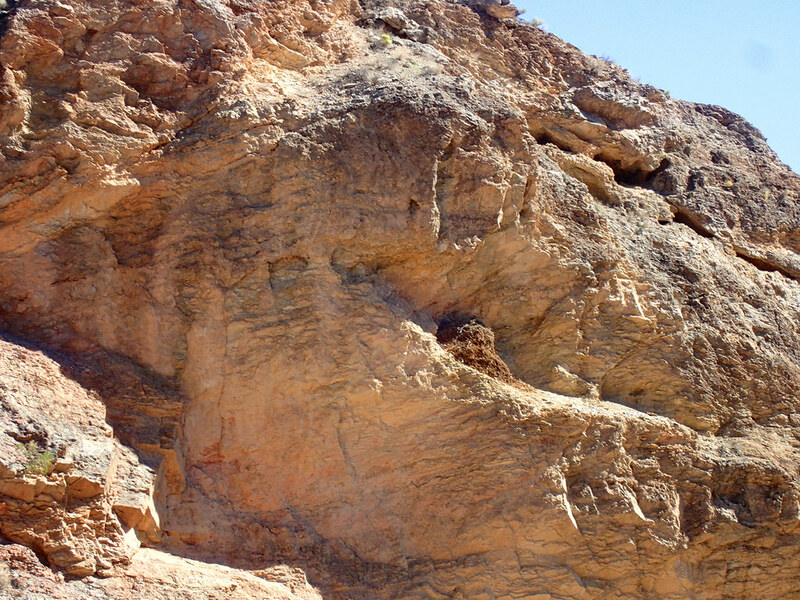 Drive 1.3 miles up the Big Pine road; the mouth of the canyon is to the northeast, marked by a black pyramid of rock at the toe of a reddish hillside. See marked outcrop, below, as viewed from the road. Watch for it as you drive. If you go a little too far, these landmarks are hidden by low hills. Coordinates for parking: 37.036391, -117.411690 (N 37°2.18346', W 117°24.7014'). Route Description: Walk northeast toward the black outcrop and the canyon mouth. It’s about three-quarters of a mile away; the canyon mouth is at coordinates 37.040863, -117.400627 (N 37°2.45178', W 117°24.03762’). The going is easy, over desert pavement and up a gradual slope. As you come to the canyon mouth, you’ll need to drop down to the right, into the wash. There’s an easy route located just at the mouth of the canyon, where a rounded ledge and some small water channels break the steep banks of the upper wash. 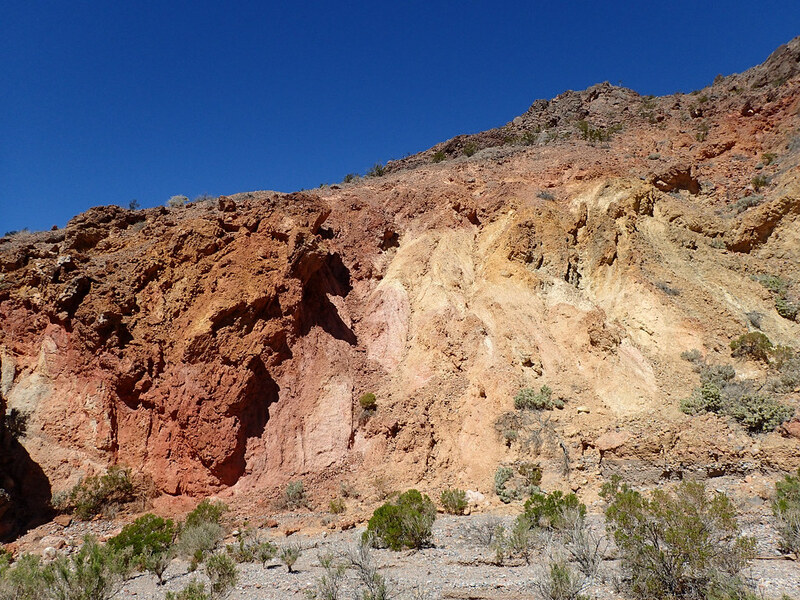 The first six hundred yards of the canyon are marked by red and yellow rocks on the northern hillside; see below. The black outcrop visible from the road is now ahead on the right. 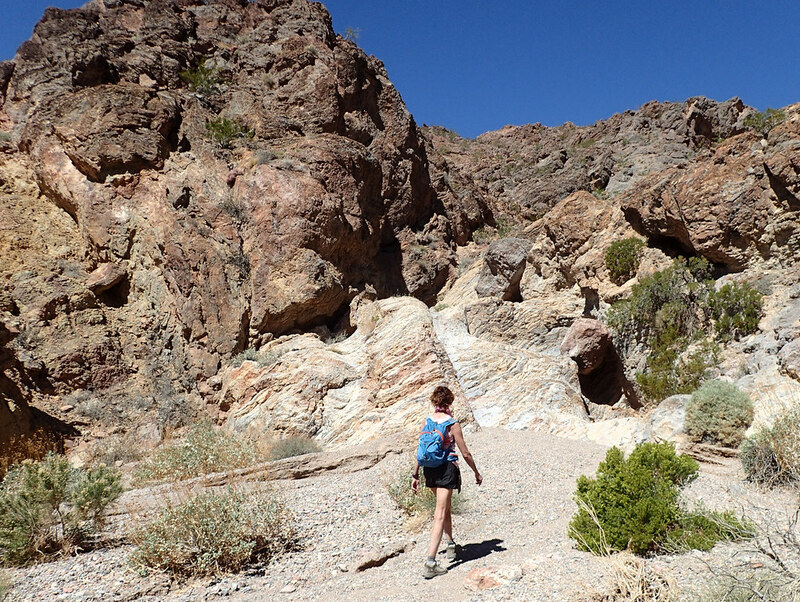 Hiking remains easy; the gravel of the wash makes for pleasant walking. The canyon kinks to the left, northwest, around the resistant rock at the toe of the ridge. The first ledge in the canyon, about 12 feet high and made of water-smoothed layered dolomite, is just beyond the black outcrop. It’s an easy walk-up. Below: approaching the first ledge. Above the ledge, the canyon turns to the right. Three or four more ledges come in quick succession; all are easy. Then the canyon opens out for another 400 yards before the next small ledge. The walls of the main canyon are seldom high. At times the cliffs close in, but these spots are more like pinch points than real narrows. The higher cliffs are mostly gray or yellowish limestone or dolomite, pocked with hollows and small caves; the sloping red or yellow hillsides are less consolidated rock, perhaps Oligocene (?) volcanics. A few more minor ledges crop out along the way; none are difficult to climb. At many places there are signs of faulting: zones of shattered and powdered rock, sometimes brightly colored, and some slickensides. 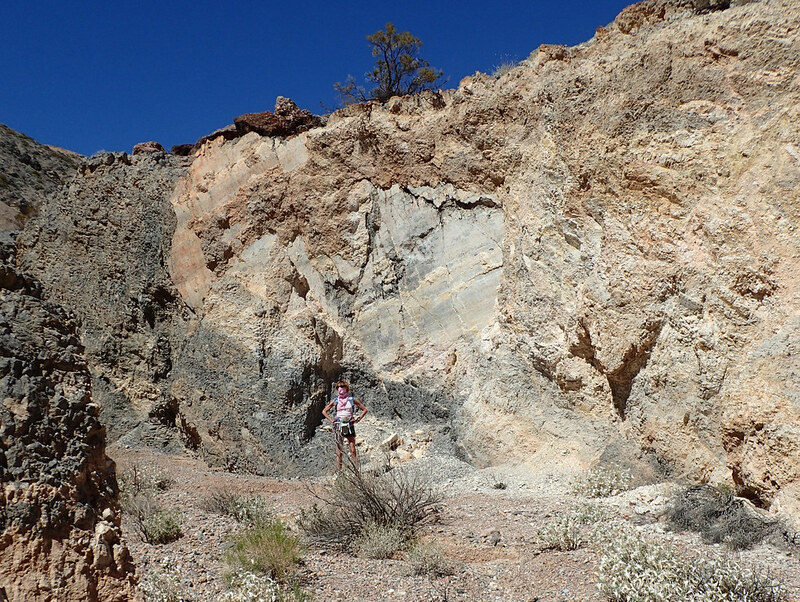 Below: a particularly large slickenside appears on the right side of the inner canyon about 1 mile in. The elevation is around 2800 feet at the canyon’s mouth, and the vegetation seems relatively varied, compared to the canyons in the lower valley. There seem to be more birds, too. Finches sang from the cliffs. On our hike we saw a red-tailed hawk, and we flushed two medium-sized charcoal-gray birds, probably nighthawks. Below: Hawk’s nest on a cliff in the inner canyon. The owner of the nest shown above, disturbed by our presence, circled above and screamed at us. It was a light-morph red-tailed hawk, almost white against the sky. 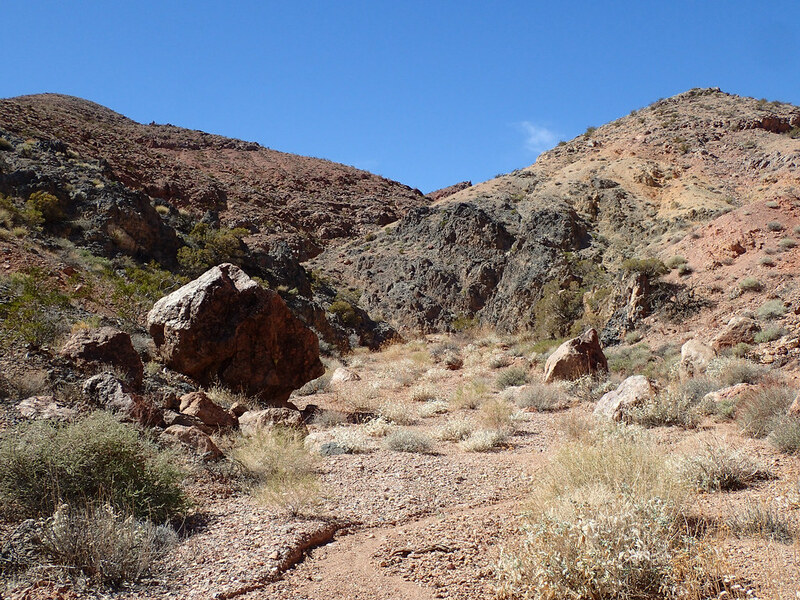 A little less than 1.5 miles from the mouth, a wash carrying reddish gravel enters the canyon from the right; it leads up a bouldery valley into the hills. Farther along, a tight little canyon in gray dolomite enters from the left; the first 200 feet are a fun scramble up several solid ledges. See image, below. This side canyon ends at a dryfall topped by a small chockstone. A broken slope to the left could be tried as a bypass, though according the aerial view there appears to be not much canyon beyond it. The main canyon continues to wind through low hills and modest cliffs. 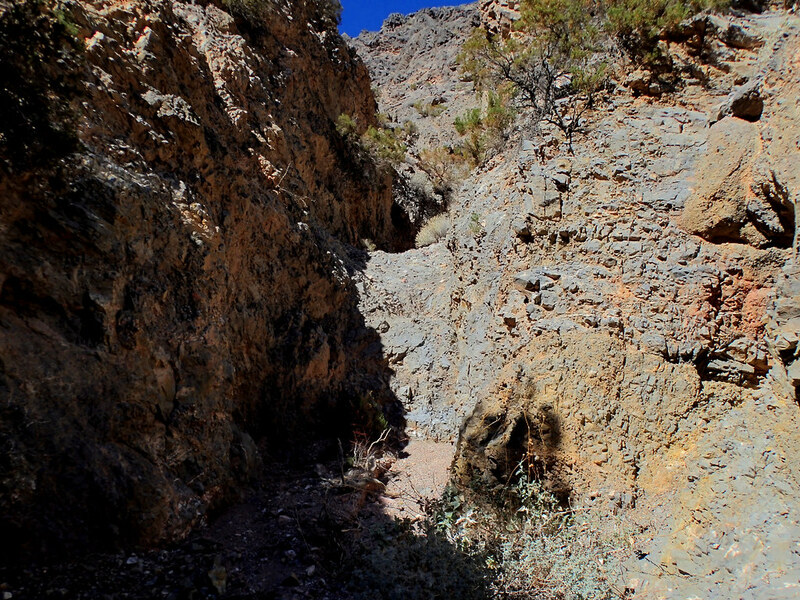 About 2.5 miles from the mouth, a large side canyon enters from the left. 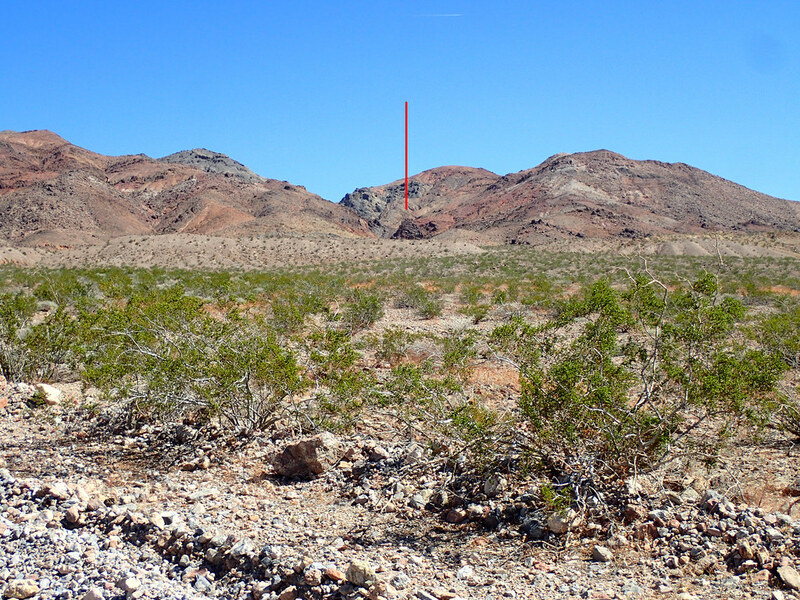 It’s marked by orange and red rock, and a low outcrop of crumbly purple stone. A short walk up this leads to a large dryfall with an overhanging ledge at the top. 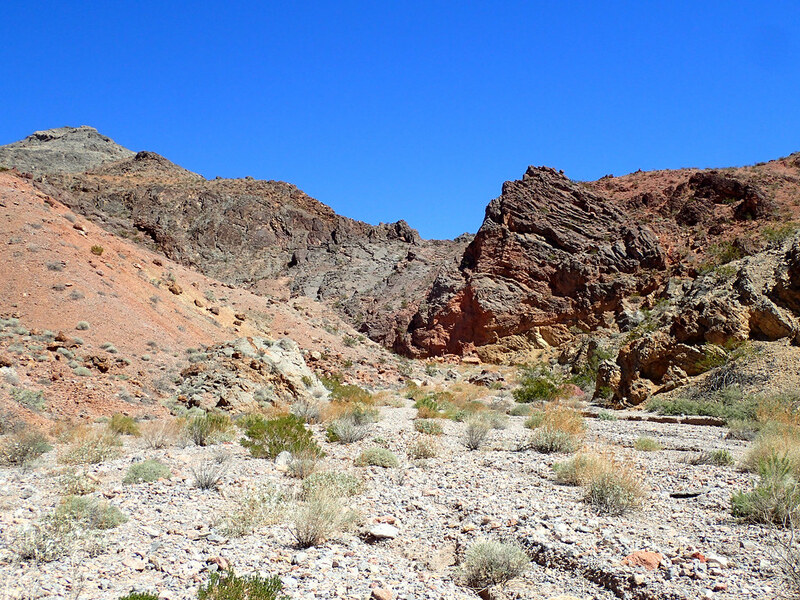 We went only a little farther; the main canyon appears to continue without major obstructions into the low northern Grapevine Mountains, gradually becoming shallower and rockier. Below: looking up-canyon into the hills. Nice trip report! Its fun to read about obscure, unknown places. About how much time did you need to do this canyon (round trip)? Very nice TR, thanks for posting. It's an interesting location that probably doesn't get much use either. I'll jump on the bandwagon also and recognize the excellent report. Ready for your next. @ netllama: I think Laura and I took about 4 hours round trip. We spent a little time in the side canyons; on the other hand, it would depend on how much farther up the canyon you decide to go. I'm flattered that people like the write-up. Thanks! Excellent report! It's great to see some documentation on one of the far northern Grapevines canyons. That is a much nicer and more major canyon than I would have expected for that area. Love your photos - so colorful and the out of the way places you visit. Keep it up!